If you've read any of Susan Grant's Borderland tales then you will surely recognize the world and situations presented in Sureblood. If you have not and this is your first time, then prepare yourself for a great adventure - a science fiction romance type of adventure, Susan Grant style. The Sureblood and Blues Borderland pirate clans, although not necessarily enemies, are rivals and tough competitors. When the new young Sureblood clan chief, Dake Sureblood begins breaking some of their unwritten raiding laws, it doesn't take long before the Blues retaliate and tensions escalate. During just such a raid, Valeeya Blue, young raider-in-training and daughter to the Blues' chief, meets the young Sureblood chief and the two end up raiding together in order to survive an unknown enemy's attack. The two begin by admiring each other's courage and grit and an attraction grows from there. At a meeting of the two clans, Val and Dake steal away and enjoy a night full of passion where they make plans for a hopeful, united future. Unfortunately, their clans and unknown enemies get in the way. Val's father is assassinated that night and the visiting Surebloods are blamed. Dake is allowed to leave Val's planet only to be ambushed and captured by the Drakkens before he can clear his name and that of his clan. In the meantime, Val becomes chief of the Blues clan where she must prove her strength to her dissenters time and again. When she doesn't hear word from Dake, Val becomes an embittered and vengeful woman. 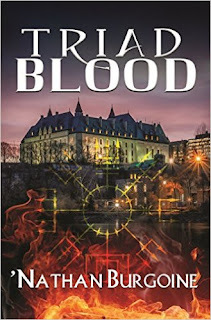 Believing them guilty of her father's death, she goes after the Sureblood clan. When she finds herself pregnant with Deke's child, she lies to protect her position and the child from her own clan, her enemies and dissenters. During the five years Dake is away, Val becomes one of the Borderlands most feared and hardened pirates. I really enjoy the world Susan Grant has created, and I'm so glad she focused this story on the pirates. The pirates are a wild and barbarous bunch; their culture is violent, although there's honor and discipline that goes along with all that violence. We meet Val when she's a young woman with potential and we go along for the ride as she matures and becomes a strong leader. We see her mistakes, self-doubts and victories -- and she makes plenty of mistakes along the way. The most glaring one being that Val lets her personal feelings and bitterness cloud her judgment, and it takes Dake's return and lots of proof to make her see the truth. Dake on the other hand is a clear thinking man -- even when we first meet him as a young man feeling his way through new responsibilities as chief of his clan. He's actually a visionary who sees beyond the obvious and I really liked him as the central male figure in this story. Together, he and Val made a passionate and courageous couple -- a Susan Grant specialty. I actually love Susan Grant's male protagonists and the way they love their women, Dake is no exception. This is the adventurous romance of two people who go through the ringer before finding that happily ever after. The science fiction details are there without overwhelming the story, and although this is part of the Borderland Tales series, the story stands well on its own. I loved getting to know quite a few of the large cast of well developed secondary characters, all of whom added depth to the story. Sureblood is a book I recommend to science fiction romance fans, or to those who just want to read a great romance adventure full of space pirates, love and intrigue. I had a wonderful time reading it. I'm looking forward to reading this one. Space pirates - Woo Hoo! Leslie, I hope you enjoy this one! You know? I'm so glad she wrote a book about the pirates... I've been curious about them ever since I read Moonstruck. Love her characters! Great review, Hils. However, I need to catch up on some of her books before jumping on this one :D Do we need to read the whole series? Thanks Nath. I don't think you need to read the whole series at all to read Sureblood, Nath. However, if you want to read Moonstruck first since you already have it in your TBR pile and then this one, then I would do that. I enjoyed SUREBLOOD and was thrilled to be able to read a science fiction romance about a heroine space pirate. Those grrrls are mad, bad, and dangerous to know. They are also *extremely* rare in the subgenre (Karin Shah's STARJACKED is the only other one of note) and I'm a happy camper since Susan delivered such a story. I particularly enjoyed Valeeya's character arc and felt that the story was ultimately hers. Very refreshing given the preponderance of vampires and werewolves in romance currently. 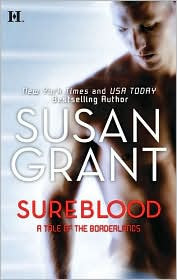 I very much recommend SUREBLOOD for romance readers new to science fiction romance. Heather, I LOVED that Valeeya turned out to be the most feared and toughest space pirate in the end. But I'm not surprised, Grant creates excellent female protagonists -- Britt Bandahar from Moonstruck is another great example.